» What are the rates of membrane transporters? Figure 1: Back of the envelope calculation of the fraction of membrane that needs to be occupied by a sugar transporter (glucose) to enable a bacterium (e.g E. coli) to divide once every half hour. Cells are buffered from the fluctuating environment that surrounds them by their plasma membranes. These membranes control both which molecular species are allowed to cross the membrane and how many of them are permitted to pass to the cellular interior. Specifically, unless a compound is simultaneously small and uncharged, passage across the plasma membrane is licensed by molecular gatekeepers. Transporting the dazzling complement of molecular building blocks requires a diverse census of membrane proteins that occupy a significant fraction of the membrane real estate as we now explore and depict schematically in Figure 1. The characteristic transport rate for sugar transporters saturated with external substrate, say a glucose transporter, is ≈100 s-1. Why should these so-called turnover rates, analogous to the kcat values of enzymes, usually range between 30-300 s-1 (BNID 102931, 103159, 101737-9) and not be much higher? We can suggest a rationalization for a common subset of transporters. Many transporters are proton-coupled meaning that they use the proton motive force to drive the transport process, often against a concentration gradient of the sugar substrate. To estimate an upper limit on a proton-coupled transporter turnover rate we focus on the on-rate of the protons. This is a prerequisite step to the conformational change that will actually perform the transport process. The conformational change might be slower and thus will ensure our estimate is indeed an upper bound. 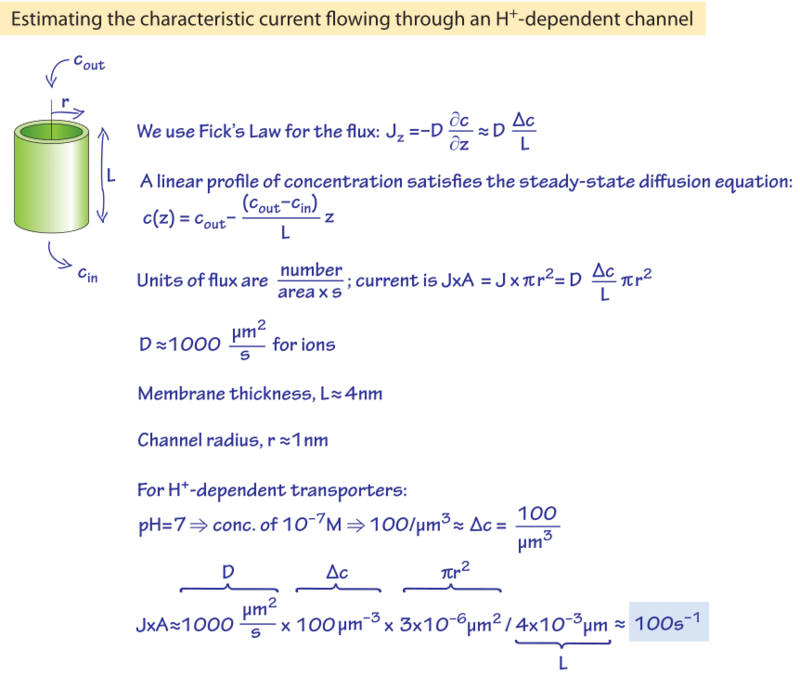 We recall that the proton concentration at pH=7 is 10-7 M and the diffusion-limited on-rate is about 109 M-1s-1. This implies that the rate at which protons hit the transporter (kon) can be roughly estimated to be ~10-7 M x 109 M-1s-1 = 102 s-1, which is the same order of magnitude as the observed turnover rate. This is effectively saying that such a proton coupled transporter works roughly as fast as it can, given the diffusion-limited rate at which protons that are serving as its energy source arrive. Alas, for the closely related sodium transporters or many ATP-dependent transporters this logic would give unrealistic limits with rates of order millions per second showing that other kinetic issues are limiting. The fastest transporter we are aware of is capnophorin, literally meaning “smoke carrier”, a transporter in red blood cells whose physiological role is to transport CO2 from the lungs, the “smoke” of metabolism. This speed demon chloride-bicarbonate transporter was suggested to reach turnover rates on the order of 100,000 s-1 (BNID 111368). Given that the concentration of both of its substrates is in the mM range we can rationalize the capacity for a 1000-fold increase in rate over the proton-coupled transporters because of the higher concentration which fuels a higher diffusion-limited on rate. Throughout this vignette, our values originate almost exclusively from studies of glucose and lactose transporters. Surprisingly, we are forced into this situation by a dearth of quantitative information on other transporters. To get a sense of what measured transporter rates imply about the numbers of membrane proteins, we now estimate how many such proteins are needed for key cellular metabolites. Assume that the carbon source is provided exclusively in the form of glucose or glucose equivalents. Is the maximal division rate dictated by the limited real estate on the surface of the cell membrane to locate glucose carbon transporters? The surface area of an E. coli membrane dividing every half an hour is ≈6 μm2 (BNID 103339, 105026). The structurally determined lactose transporter has an oval shape normal to the membrane with dimensions (long and short axis) of 6 nm x 3 nm (BNID 102929). Assuming a similar size for the glucose transporter, the area it occupies on the membrane is ≈10-20 nm2 (though a value about 4 fold larger for the glucose like PTS transport system is reported in another species of bacterium). For importing the ≈2×109 sugar molecules needed solely to build the cell mass (each consisting of six carbon atoms) within a conservative cell cycle duration of ≈2000 seconds, the fraction of the membrane area required is already ≈2% as estimated in Figure 1. Thus, a substantial part of the membrane has to be occupied just to provide the necessary carbon even under conservative assumptions. Can it be that maximal growth rate (less than 1000 second generation time) is constrained by the ability to transport carbon? Dedicated experiments are required to clarify if there is a limitation on increasing the fraction of transporter much further (say to 10%). One should also consider that the respiratory system for energizing the cell needs to reside on the membrane in bacteria and that packing idealized oval machines on the membrane 2D surface cannot reach 100% coverage for geometrical reasons. Membrane transport is not the only process that might potentially limit the maximal growth rate. Other issues rival the number of available membrane transporters in their role for limiting the maximal growth rates, and probably should be thought of as co-limitations. In the vignette on “What is faster transcription or translation?” we discuss the tricks bacterial cells use to achieve fast doubling time with only a single origin of replication. Further, the vignette on the number of ribosomes in the cell shows how quantitative studies found that under fast growth rates, ribosome concentration grows linearly with growth rate and that the rate of translation may constrain the limits on maximal growth rate. Indeed, it is clear that there are a number of processes that can potentially constrain maximal growth rates besides the transport of nutrients across the cell membrane, although, the estimates provided here clearly demonstrate the need for careful thought about the management of membrane real estate. A similar calculation can be performed for budding yeast. The volume and thus the number of carbons required is ≈50 times (BNID 100427) larger than in E. coli, whereas the surface area is ≈10 times larger and the fastest generation time is ≈5 times longer at ≈6000 seconds (BNID 100270). Thus, the areal fraction required for the transport of carbon building blocks is suggested to be similar. Notice though that under maximal growth rate conditions, yeast performs fermentation to supply its energy needs, which dictates a significant additional transport of sugars (actually E. coli often does that as well and emits carbon as part of overflow metabolism). A measurement shows that under growth rates up to one division per 140 min, approximately half the carbon is lost in fermentation (with an even higher proportion at faster growth rates) (BNID 102324). Thus, the required surface fraction covered by transporters is suggested to be at least double that found in the bacterial setting, resulting in ≈4% areal coverage. This estimate motivates an experimental test: will the expression of a membrane protein not related to transport decrease the maximal growth rate of yeast and E. coli by limiting the available area for transporters?